The jack bean and the sword bean are very similar. Other names for them are: Chickasaw lima bean, Brazilian broad bean, coffee bean, ensiform bean, horse bean, mole bean, go-ta-ki, overlook bean, Pearson bean, watanka, and raba de burro. 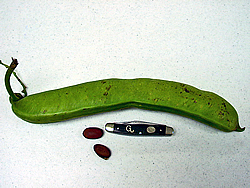 In both species, pods reach a length of 10-14 inches, and a width of 1 to 1* inches. Seeds are large, *-* inch long and nearly as broad. The two species differ mainly in the length of the seed hilum (scar). The hilum of sword bean (C. gladiata) is more than one-half the length of the seed, whereas that of the jack bean (C. ensiformis) is only about one-third as long as the seed. Most of the jack beans identified in Texas have been white with a black seed scar, while the sword beans have been red seeded. There probably are many varietal and environmental variations in the growth habit of the plants; however, it appears that the jack bean plant is bushy in comparison with the vining nature of the sword bean plant. One gardener noted that one sword bean plant covered his entire garden of 400 square feet. Neither bean has commercial importance in this country. Both are reported to be edible in the young tender immature stage by slicing and boiling the tender pods, or peeling and using the seeds as broad beans. Also, reports have indicated the possibility of mild toxicity of beans when eaten in large quantities. Because of this, the boiling water should be drained off to remove any poisonous substances coming from the beans. Pharmaceutical companies have shown some interest in the beans as a possible source of the enzyme urease. Jack Bean-- Canavalia ensiformis-- is naturalized in Texas in places.